Ready to show off your Baggo skills? 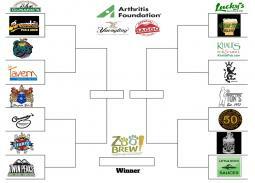 Yuengling and Baggo are hosting a Baggo Tournament around central Arkansas to benefit The Arthritis Foundation Arkansas! Each 2 person team must register online through the site listed for $30 and each member will receive an event t-shirt. The winning team (double elimination) from each location will go on to represent the bar / resturant they won at, in a specail championship tournament at Zoo Brew on September 20th (tickets to event included upon winning prelim round).